Ernst Walter Mayr (/ˈmaɪər/; 5 July 1904 – 3 February 2005) was one of the 20th century's leading evolutionary biologists. He was also a renowned taxonomist, tropical explorer, ornithologist, philosopher of biology, and historian of science. His work contributed to the conceptual revolution that led to the modern evolutionary synthesis of Mendelian genetics, systematics, and Darwinian evolution, and to the development of the biological species concept. Mayr was the second son of Helene Pusinelli and Dr. Otto Mayr. His father was a jurist (District Prosecuting Attorney at Würzburg) but took an interest in natural history and took the children out on field trips. He learnt all the local birds in Würzburg from his elder brother Otto. He also had access to a natural history magazine for amateurs, Kosmos. His father died just before he was thirteen. The family then moved to Dresden and he studied at the Staatsgymnasium (“Royal Gymnasium” until 1918) in Dresden-Neustadt and completed his high school education there. In April 1922, while still in high school, he joined the newly founded Saxony Ornithologists’ Association. Here he met Rudolf Zimmermann, who became his ornithological mentor. In February 1923, Mayr passed his high school examination (Abitur) and his mother rewarded him with a pair of binoculars. Mayr said he was an atheist towards "the idea of a personal God" because "there is nothing that supports [it]"
1 2 3 Bock, Walter J. (2006). "Ernst Walter Mayr. 5 July 1904 -- 3 February 2005: Elected ForMemRS 1988". Biographical Memoirs of Fellows of the Royal Society. 52: 167. doi:10.1098/rsbm.2006.0013. JSTOR 20461341. ↑ Meyer, A. (2005). "On the Importance of Being Ernst Mayr". PLoS Biology. 3 (5): e152. doi:10.1371/journal.pbio.0030152. ↑ Rennie, J. 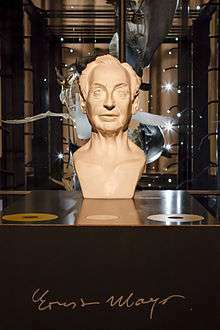 (1994), Profile: Ernst Mayr – Darwin's Current Bulldog, Scientific American 271 (2), 24-25. 1 2 3 Mayr & Provine, 1998:p. 413. 1 2 3 4 5 Barrow, Mark V. (1998), A Passion for Birds: American Ornithology after Audubon. Princeton University Press. ISBN 0-691-04402-3. ↑ "Evolutionary theorist dies at 100". MSNBC. 2005-04-02. ↑ "Daniel Giraud Elliot Medal". National Academy of Sciences. Archived from the original on December 29, 2010. Retrieved 2 March 2016. ↑ Sagan, C. (1982). "Extraterrestrial Intelligence: An International Petition". Science. 218 (4571): 426–426. Bibcode:1982Sci...218..426S. doi:10.1126/science.218.4571.426-a. ISSN 0036-8075. ↑ Sagan, Carl (1995). "The Abundance of Life-Bearing Planets". Bioastronomy News. 7 (4). 1 2 Brockman, John, ed. (October 31, 2001). "Ernst Mayr: What Evolution Is". Edge. 92. Gill, F. B. (1994). "Ernst Mayr, the Ornithologist". Evolution. 48 (1): 12–18. doi:10.2307/2409998. JSTOR 2409998.